Door Pottery will be one of a number of contemporary potters displaying at the upcoming Columbus Pottery Show & Auction. Door Pottery is based in Madison, Wisconsin and was founded by noted potter Scott Draves. In addition to the items on display and for sale at the show two Door Pottery pieces will be offered in the auction on Friday evening. Door Pottery produces a wide range of pottery often in the Art and Crafts style. Door Pottery also produces works that are affordable and work within many different design styles. Pictured is Lot 140 from the Auction on Friday evening. 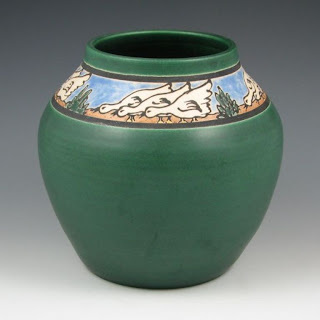 Visit Scott Draves and Door Pottery at the Columbus Pottery Show and Sale.